Trenwa is excited to announce our new Composite Fibrelite™ lids for road crossing (HS20) trench. 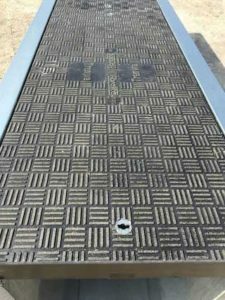 These trench lids are non-conductive, chemical resistant, lightweight yet extremely durable and will withstand traffic and harsh field conditions for many years. When combined with our concrete road bases they create an ergonomic, yet affordable system for drive over areas. They are available for all of our HS20 trench bases from 10″ wide to 48″ wide. They do not require annoying ‘protection rods’ to achieve HS20 rating. See our product bulletin for more information.